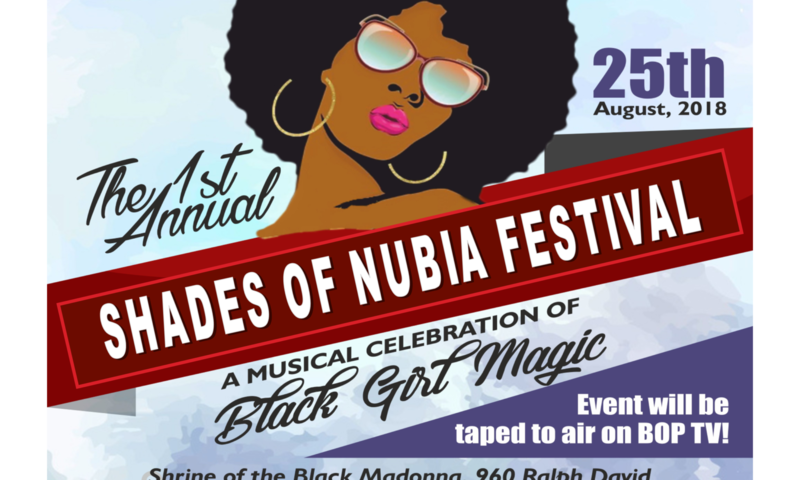 The Shades of Nubia Festival is an amazing event that honors the creative genius and achievements of Black Women in the arts. It will provide much needed exposure to the awesome talent of Black Women, that continues to breathe life into our communities through the arts. Watch fifteen amazing sisters, as they showcase their creative artistry through music, spoken word and dance! There will be vendors and an auction of amazing art, jewelry and fashion, all curated by way of Black Girl Magic! This event will be recorded live and will air on the Black on Purpose Television Network. Do you have that FIRE!!! That Black Girl Magic FIRE… We are seeking the Black Girl Magic FIRE of female vocalists, dancers, visual and spoken word artists. Fifteen of the baddest submissions will be selected to showcase their talent for our 2018 Shades of Nubia Festival. If you are one of the selected, not only will you gain exposure, your performance will also be aired on BOP TV and you will receive a copy of your performance. However, if you are not selected as one of the 15, you may be considered to perform at future events on BOP TV. Please sign up for our other events. Performance spots for this event are SOLD OUT! 2.) Click the link below to submit payment for $100.00, which is a non-refundable submission fee per act. Submissions will not be viewed without payment. 3.) 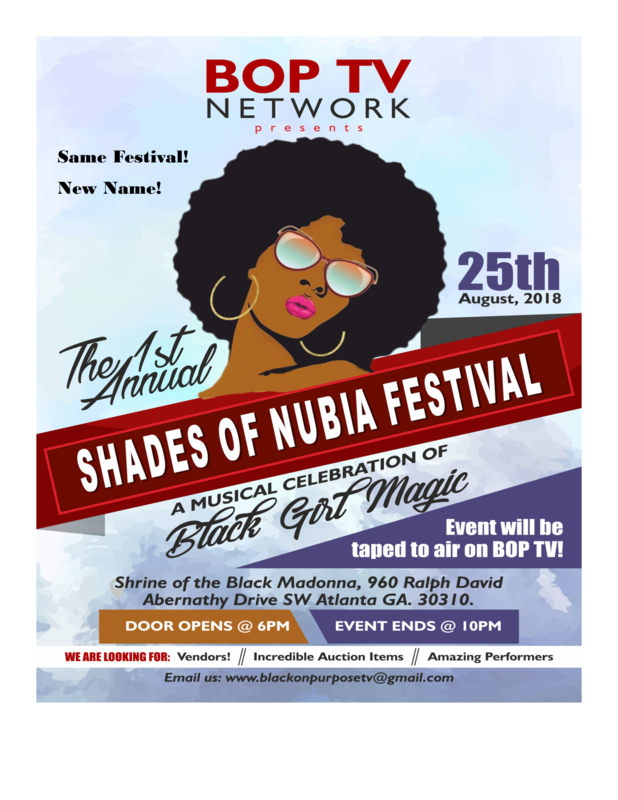 We will contact you, if you have been selected to participate in the 2018 Shades of Nubia Festival, which is on August 25, 2018, from 6-10pm. Thank you for participation with Black On Purpose Television Network. We look forward to working with you. Please sign up for our other events. Vendor spots for this event are SOLD OUT! There is a $150 vendor cost, so to allow for a proper and profitable vendor experience, we will not have more than 2 types of vendors at this event. This gives each vendor an opportunity to display and sell their merchandise without excessive competition. Tables and chairs will be provided for Vendors. Saturday doors will open at 5:00 pm for Vendor set up. The event will begin at 7:00 pm and is over at 10:00 pm. No Vendor will be allowed to set up after 6:15 pm and the Vendor fee will not be refunded. If you need to replenish your stock during the Festival hours, you will have to hand-carry your supplies to your vendor spot.